The Big 3: Paul Pierce, Ray Allen, and Kevin Garnett. Sorry, I meant to say Big 4, add to the mix the supposed question mark of the Boston Celtics’ 2008 title run, point guard Rajon Rondo. The player people most often fail to be mention however among this elite group of players Kendrick Perkins is the unsung 5 among the star-studded Big 4. 6:30 into game 6 of the NBA Finals, Kendrick Perkins landed awkwardly on his left knee and was forced to leave the game. He did not return. Boston went on to lose the game 89-67. One of the big questions after game 6 was the health of Kendrick Perkins. Unfortunately for the Celtics, Perkins was ruled out of game 7 yesterday, which is cause for concern in bean town. Kendrick Perkins may not be the most flashy player out there. In fact, he is a very limited player. Well, at least on the offensive end. Perkins is consistently left open for short jumpers by opposing teams and time after time he passes up exceptionally good looks. He knows his place on the Celtics, and his place is not a scorer. 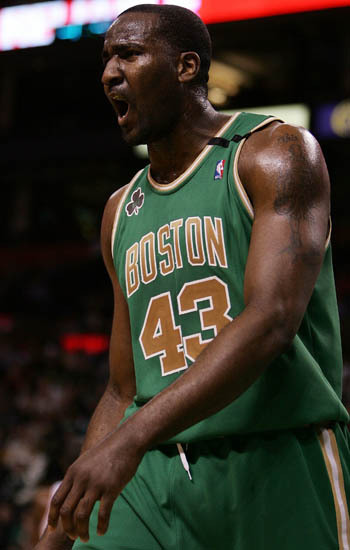 Perkins is known around the NBA for his intensity and most notably the look of anger that doesn’t seem to ever go away. Throughout the 2010 NBA playoffs Kendrick Perkins has been asked to face some enourmous challenges. In the Eastern Conference Finals he was asked to guard the taller, longer, more athletic Dwight Howard and for much of that series held him in check. In the NBA Finals he has been asked to guard the also longer, taller Andrew Bynum Bynum has been ineffective through much of the series. Although that is partly due to his injured knee. Now the Boston Celtics have to deal with life without Kendrick Perkins. People may say that Kevin Garnett is the glue that holds everything together. That may be partially true, but Kendrick Perkins is no slouch. Perkins does not get the recognition that the other stars on the Celtics do, but he still goes out every night and plays his behind off. Without the Celtics 5th man, they will have to rely mostly on Rasheed Wallace and Glen “Big Baby/Shrek” Davis to carry the load at center. Glen Davis has had his moments during these playoffs but since he and Nate Robinson broke out in Game 4 he has been virtually invisible. Despite having 9 rebounds in game 6, Big Baby didn’t have a single point in 27 minutes. Rasheed Wallace was also held off the scoresheet in game 6 going 0-6 from 3 and 0-7 from the field in 17 minutes. You wonder if the added minutes for Big Baby are just too much for him to handle. I don’t think that he is mentally bothered by the pressure, but physically it could take a major toll on him. Coming out of LSU Glen Davis has had weight issues, but in the NBA he has gotten it all together. But for a guy like that can you be confident that he can play added minutes? Glen Davis relies on pure energy and hustle to make up for his lack of athletic ability and size compared to other big men. Added minutes means less just a smidgen less energy per play, which means that he probably can’t make up for his physical disadvantages to as great an extent. Rasheed Wallace on the other hand has been an enigma this entire season for the Celtics. For him, it’s not lack of physical strength or athletic ability it’s more an intensity issue. Wallace is a proven winner but also a guy who decides for himself when he wants to play. Wallace is a guy I would have put money on to have a big game for my team in his younger days. However, now that he is 36 he is not the player he once was. The Boston Celtics obviously can’t rely on him like the Detroit Pistons could in big games. Almost everyone had counted out the Boston Celtics during the regular season, and almost everyone is now. To me I can’t find a real reason to pick the Celtics to win tonight. Defence is a big part of what defines the Boston Celtics, and Kendrick Perkins is a big part of that defence. It showed last game. The Celtics have shown that never say die attitude throughout the playoffs and it will be there tonight. In the end, I just don’t think it will be enough to handle Kobe Bryant and the LA Lakers.